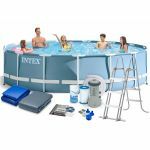 Enjoy hours of outdoor fun with intex frame pool - from starter pools to big enough for the whole family and neighborhood! 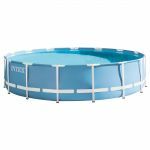 Durable and easy to assemble, Prism Frame Poolsfeature all og the great benefits of Metal Frame pools, and are enhanced with strong powder-coated steel tubing and a stylish and upscale looking liner color. 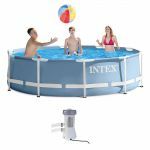 from our 10' (3.05m) starter pool, which is great for a family's first pool and perfect for smaller children, to our huge 24' (7.32m) pool which can hold all the neighbors' kids, there's an intex prism Frame pool for every family and for every occasion! This premium pool line is broad enough to meet virtually and family's requirements from beginning swimmers to neighborhood-size hoilday parties!